For years, jets taking off from Newark Liberty International Airport have performed an act of mercy as they roar south. 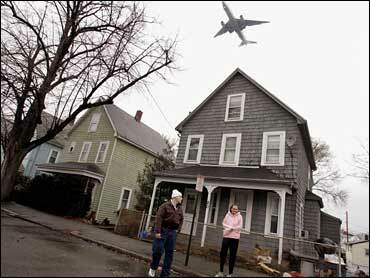 Moments after leaving the ground, the planes bank left, out over an industrial port district, and away from the residential streets of Elizabeth, N.J., the working-class city that sits right up against the busy airport. Maneuvers like this are a common method of sparing citizens from the window-rattling noise of jets passing overhead. But now such practices are being dropped in some places in the Northeast as part of a federal plan to ease record flight delays. And some neighborhoods that fear they will be subjected to more noise are fighting back in court. On Dec. 19, the Federal Aviation Administration began its first overhaul in decades of the jet routes that crisscross the country's most congested airspace - a 31,000-square-mile area around New York and Philadelphia. The corridor has been criticized for years as one of the worst problem spots in the nation's beleaguered air traffic system. Most the paths were laid out in the 1960s. Some date from the earliest days of air travel, and airlines have been complaining for years that they are horribly outdated. Over the next five years, the FAA will be rolling out new routes it believes can cut flight delays by as much as 20 percent. Some aviation experts say improvements are essential; nearly three quarters of all flight delays nationally are caused by backups in New York and Philadelphia. But a closer look at the revamped flight routes shows that the changes will lead to more noise for tens of thousands of people, many of whom are already are subject to the whine of jet engines because of their proximity to airports. In Elizabeth, N.J., the changes will mean that some planes will fly straight over the center of the city. "The FAA plan will do more harm to the city of Elizabeth than any terrorist incident," said Mayor Chris Bollwage. "We live next to the airport, so we have to take some noise," he said. But the FAA plan, he added, stretches fairness. "There are places in town where you can touch the tires." At least 12 lawsuits have been filed so far in an attempt to stop the plan. Congress ordered the Government Accountability Office to examine the FAA's method for choosing the new routes. Top lawmakers from several states have demanded changes. Sen. Robert Menendez, D-N.J., threatened to block Senate confirmation of acting FAA administrator Robert Sturgell if the agency doesn't halt implementation. So far, the complaints haven't stopped the FAA. Last month, the agency began phasing in new traffic patterns at the Newark and Philadelphia airports that allow departing planes to fan out in several directions as they climb, rather than stick to a single path. In theory, the change will allow more takeoffs per hour, but outside Philadelphia it will also mean more planes over a cluster of suburbs in Delaware County, just west of the airport. Since the first of the changes went into effect in Philadelphia on Dec. 19, the airport said it has been getting three complaints a day about noise, compared with about one every two days in the previous three months. FAA officials say the airspace redesign will actually lead to a reduction in noise for a majority of people, largely because the changes will allow planes to fly at higher altitudes. But sound-modeling data released by the agency reveals that the gains and losses will not be spread evenly. Loud neighborhoods will, on average, be getting louder, while the biggest improvements will be in places that aren't that noisy to begin with. According to the FAA, an additional 30,600 people will find themselves living in neighborhoods where the average daily aircraft noise level is 60 to 65 decibels - considered the high edge of tolerable for a residential area. Noise at that level is far from earsplitting; experts say it is less than residents might experience if they lived next to a busy road. But it is loud enough that people have to raise their voices as a plane passes overhead. The number of people living in areas where the average decibel level is between 55 and 60 will rise by 79,813. The big losers will be a few communities near Newark and Philadelphia that already hear a good deal of airplane traffic because of their proximity to the airports. There will also be a slight to moderate increase in noise in parts of Morris and Sussex counties in northern New Jersey. The big winners are people who live a little farther away, and now hear a medium amount of noise. By 2011, the FAA estimates that there will be nearly 728,650 fewer people living in areas where the daily noise level is between 45 and 55 decibels - louder than a refrigerator hum, but quieter than two people talking in a room. Many of those people are in a corridor running southwest from New Brunswick, N.J. There will also be noise benefits in pockets of densely populated Essex County, N.J., which includes Newark, and parts of northeastern Pennsylvania. The opposition is not just coming from areas likely to see big changes. Fourteen municipalities in western Connecticut have been trying to get the plan blocked, largely because it will shift an arrival path for New York's LaGuardia Airport eastward, creating what the FAA says will be slightly more noise for some towns in Connecticut. "It's a quality-of-life issue," said Rudy Marconi, a spokesman for the Alliance for Sensible Airspace Planning and a selectman in Ridgefield, Conn., 40 miles northeast of LaGuardia. "Will I get used to it? Probably. But should I have to get used to it?"